There are a couple of ways to import a mod into Tabletop Simulator if you aren’t getting them from the Steam Workshop. 1) Save files: If you received a save file from someone, then you place it in the location where your Save folder is. That is usually at Documents/My Games/Tabletop Simulator/Saves. Place the save file in this folder, keeping in mind whether you already have a save of the same number or not (they can be renamed). Save files are complete as is, with everything already included. 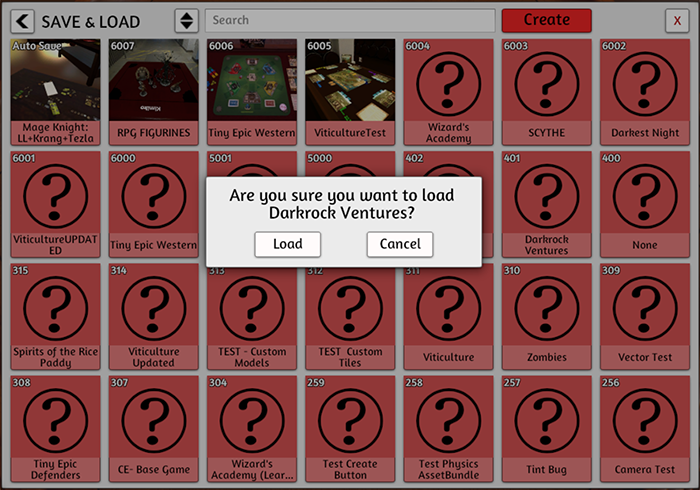 Login to Tabletop Simulator and start up a game. Then click GAMES -> SAVE & LOAD and choose the save you’d like to load. You will be prompted whether you wish to load this save or not. You can read about saving and loading games here. Only numbered files can be placed in the Saves folder. 2) Mod files: If you download a mod from another site like Nexus Mods or someone gives you a named .json and all the images and models, then you need to place them in your Mods folder at Documents/My Games/Tabletop Simulator/Mods. 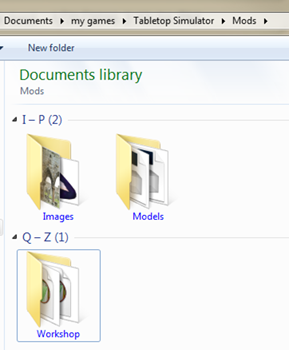 In the Mods folder, you have three other folders – Images, Models, and Workshop. In the Models folder, this is where you place all the .OBJ files. The Images folder will contain all .JPGs and .PNGs (Deck template images, dice templates, all your images!). The Workshop folder is where you place your .JSON file. This is usually a series of numbers or it can be named. Keep in mind that named .JSONs cannot be deleted from in-game. This JSON file is also where you want to name your “GameMode”. By default it’s set to None. Name this so it’s easy to locate your game. Once you have everything imported, you can now click on GAMES -> WORKSHOP and locate your game in the list.